Returning for its sixth year, Mile of Music, presented by Tundraland, is back today through Sunday with 200-plus artists scheduled to perform at 70 different venues. 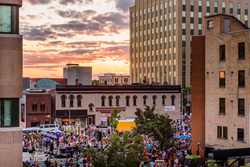 The festival takes place in Appleton, Wisconsin, and highlights original music from up-and-coming artists across the United States and Canada. This is the true definition of a collaboration with all of the individuals and organizations that step up to make the music happen. Mile of Music, presented by Tundraland, returns to Downtown Appleton today through Sunday (August 2-5) with 900 live performances and dozens of music education events planned for the weekend. Beyond the 900-plus live performances, Mile 6 will also feature dozens of interactive, educational events organized by the Music Education Team that’s headed up by staff at Lawrence University Conservatory of Music. These activities allow attendees of all ages and skill levels to get in on the music-making with opportunities to participate in dancing, drum circles, songwriting, instrument workshops and jam sessions. Fun festival staples like the Mile of Music bus and pop-up performances will be back for the weekend at Mile 6, and there will also be additions like rides from the Social Station Mega Cycle on the Downtown Appleton festival route. The festival continues to be a success thanks to the tremendous support from the community as well as state and national sponsors and a long list of local sponsors. This support includes everything from volunteers to in-kind donations and stage/merchandise partnerships. It also includes strong financial backing from Tundraland – a home improvement company that has served as the music festival’s presenting partner for the last four years and continues to recognize how music and art can positively affect a community’s culture. To learn more about the artists, performance schedule, music education events and other festival details, visit http://www.mileofmusic.com. Mile of Music is an original roots music festival that launched in August 2013 as a creative and economic catalyst in Downtown Appleton, Wis. The four-day festival is held in August with the support of more than 100 community sponsors and 400 volunteers. It features 900 live music sets and 200 artists at 70 venues along the one-mile, walkable stretch of College Avenue and the nearby riverfront.